BLANCO’s Thermal Transfer Weatherproof labels are made from a 2.6Mil White biaxially oriented polypropylene (BOPP) film. These labels are designed to work where durability is needed. They are great for rigid containers, drums, waxy corrugated boxes in cold environments, etc. They will stand up to harsh outdoor environments. BLANCO manufactures these labels with an imprint varnish so that standard wax ribbons can be used for printing. 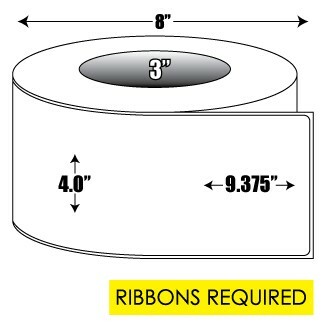 If the labels are exposed to chemicals or harsh outdoor environments, you will want to consider using a more durable ribbon than wax. Adhesive: Hot melt rubber permanent adhesive developed to combine the optimum in cold-temperature performance. This adhesive was developed specifically for use in freezer and cold temperature applications. This adhesive will develop a permanent bond to most packaging films and materials when applied at temperatures as low as 0°F. This adhesive is most noted for its outstanding performance on waxy corrugated cardboard.